matter if the concrete is 1 month old or 10 years old, acid stained concrete can be done on just about any type of concrete, old or new. 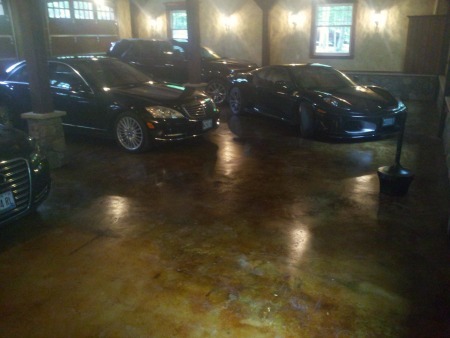 and also the fact that acid stained concrete floors are easy to clean & maintain. Garage floor acid stained and sealed in Belgrade, Me. Above is a garage floor acid stained by Day's Concrete Floors, Inc. Notice the dramatic effect the acid stain had on the concrete floor. This is exactly what the homeowner wanted. To lesson the effect we could have cut the acid stain with some water (2 parts water to 1 part acid stain). on this web-site and follow some of the tips I will share with you below. To achieve great results, there are some things I have learned over the years that only comes with experience. Here are 10 tips for achieving great results after you've decided to acid stain your concrete floor. 1. Cleaning the concrete is very important. Be very fussy about removing paint, sheet rock putty, oil, grease, gum, dirt, and any other contaminants. Acid stain will not react with these and be very visible in the finished product. Don't use an acid-based product to clean the concrete, a mild degreaser, mineral spirits, scrub brush, wire brush, putty knife, and warm water are all things you can use to clean the concrete. Rinse Rinse Rinse, at least 3 times to remove all the residue, you should be able to wipe your hand on the dry concrete and not feel any dirt or have any dust on your palm. in the concrete mix. I find most customers aren't happy with their first choice if they have some others to compare it too. 3. Always do samples on YOUR concrete floor before you go ahead and buy all the acid stain. Most companies have sample bottles they will sell you, and for the reason stated in tip #2, you won't know what the stain will look like on your concrete until you do a sample on your concrete. The sample areas must be sealed and/or waxed (if interior) to get the true look of what the acid stained concrete will look like when finished. 4. When purchasing the acid stain, buy some extra, you don't want to run out and you may need to apply a second coat to get the desired effect you're looking for. 5. Mix multiple bottles of the same color of acid stain together in a 5 gallon bucket, different batches could give you different results on your concrete floor, patio, or driveway. 6. Some acid stain manufactures recommend that you cut the acid stain with water 1:1. If your concrete is hard troweled and very smooth, this diluted solution may not be strong enough to etch the concrete and deposit the color. You may have to use the acid stain full strength. Keep this in mind when doing a sample (try it both ways). 7. Protect! Protect! Protect! I can't stress this enough. Protect yourself with rubber gloves, boots, safety glasses, mask, proper clothing, and protect the surroundings with plastic & tape. Acid stain will burn your skin, etch glass, stain wood, and kill grass and plants. Take the time to cover anything you don't want over-spray or drips to get on. 8. Always have a back-up sprayer. Acid-resistant sprayers are relatively inexpensive, they're also cheaply made and frequently break down. Have at least one back-up, maybe two, you can always bring back the one you don't use. Test the sprayer with water before staining, adjust the wand to spray a fine mist for application of the acid stain. works best for this sealer. 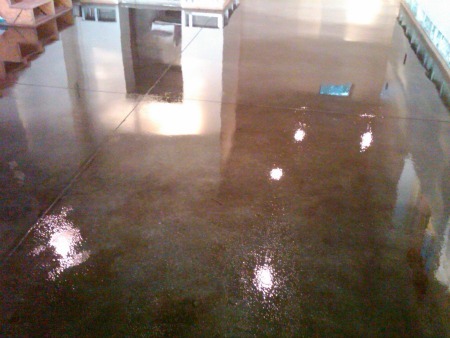 For interior concrete acid stained floors you have a few choices. If you're a do it your-selfer, 2 coats of water-based concrete sealer and 3-4 coats of floor wax works very good. (like in the picture below) Experienced installers can seal the concrete with epoxy and urethane sealers for surfaces that will receive a lot of foot traffic. Acid stained basement floor in Monmouth, Me. on this site, watching some you-tube videos about how to acid stain concrete, and/or take a class or seminar in your area if they are offered. The time and money you invest learning about acid staining concrete will be well worth it.